On a touchscreen device, you can touch and drag, even fling the map around (kinetic scrolling). On a non-touchscreen device, you can use the D-pad or trackball to scroll the map. You can zoom-in (on the center of the map) or out by tapping the associated icons and . You can also double-tap the map to zoom-in on a specific location. On non-touchscreen devices, use the D-pad button, and if you have a keyboard, the letter I or the digit 3 to zoom-in, and the letter O or the digit 1 to zoom-out. You can also use the volume buttons of your phone. On Android 2.1 and later devices, the most natural way to zoom in and out is pinch-zooming also known as two-finger zooming. To switch between the active map providers, you can use a lateral three-finger drag: place three fingers on the screen and move them from the left edge of the screen to the right, or vice-versa. This works best if you have customized your map providers by only keeping a few visible in the Map Manager. This is only available on Android 2.1 and later, and on devices that can handle more than two touch-points. 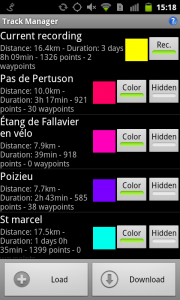 By touching and holding the map, you can add and edit waypoints or use the contextual menu. You can center the map on your current GPS location by tapping the GPS icon or typing G or 5. This enables the map to keep following your current location until you manually move it. Note that if the GPS is having trouble locating you, the location may be imprecise (red GPS bars). When the map follows the GPS location, a blue glow will be displayed around the GPS icon. To help getting back to the GPS icon after exploring your vicinity on the map, MyTrails can optionally center the map again on your current location after 15 seconds. Depending on your preferences, the current GPS location can be denoted by an icon or a blue circle with a central red dot. This circle indicates the area within which you're likely to be; the larger it is, the less precise the GPS reading. When the GPS reading is so precise that the blue circle is too small to see, the larger red icon is used. If your speed is not too low, the GPS is able to determine your direction, and a direction arrow is displayed instead. When MyTrails is recording a track, a notification icon is displayed in the notification tray: . If you don't see that icon (in addition to the Android GPS icon), that means the track is not being recorded. You can align the map with the direction you're currently facing by tapping the compass icon or typing C or 2 (if the device has a built-in compass). If you feel the view is too wobbly, you can activate a preference to keep it more stable, at the expense of a slower reaction to changes of orientation. Note that even when the option to follow the compass is not set, the red compass needle will point North (after a few seconds without user interaction, MyTrails may switch the compass off to save battery). You can also choose in the preferences to align the map to the direction of travel, when you're moving fast enough for the GPS-detected direction to be accurate. If you hold the device close to a metal object, the compass will likely behave erratically, just as a physical compass would. The compass is also designed to operate when the phone is held horizontally. A scale is drawn to indicate distances on the map. It can be switched to Metric or Imperial units in the Appearance preferences. It also indicates the duration since the track recording started, and the approximate distance covered. Note that since GPS readings are not always accurate enough, the recorded track may contain zigzags and the resulting distance may be exaggerated. A LED is displayed to the left of the distance. It illustrates the current state of track recording. Tap it for more info, and for a color legend. Tap the rest of the scale display for a summary of the current recording. By default, the scale is unobtrusive. If you're having difficulty reading it in harsh sunlight, you can make it bolder in the Appearance preferences. The zoom level can optionally be displayed next to the zoom buttons. This is a number between 1 and 18: the higher the number, the more zoomed-in the map. When MyTrails displays map tiles that belong to the next-higher zoom level, the zoom is indicated with x2 (or x4), by analogy with digital zooming on cameras. You can force MyTrails to use this digital zooming (to make it easier to read details on a map without loading the tiles for the next zoom level) by long-tapping the zoom button. The coordinates of the map center may optionally be displayed above the scale. To quickly glance at your current altitude, current or average speed, you can bring up the Head-Up Display, by performing three-finger swipe from the top of the screen to the bottom. You can hide the HUD again by the opposite gesture, or leave the HUD visible permanently. If your device can not handle a three-finger gesture, you can show and hide the HUD in the preferences. If the GPS doesn't have a good enough fix, the current speed and altitude may not be available. The average speed is always available, and is based on the total distance and time, indicated in the scale. You can also choose to enable the permanent scale, which shows a color-coded reference of the colors used for the track. 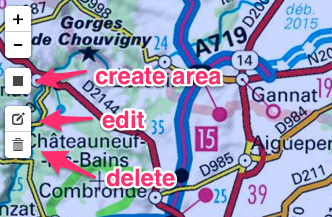 Save: save the recorded GPS track as a GPX file. The file will be placed on your external storage - usually the SD Card - in a folder called MyTrails, and added to the Track Manager. If a track is being recorded, hitting the back key brings up a dialog asking you whether you would like to keep running the GPS tracker in the background or stop it. Once you stop it, no track is recorded and no further battery is consumed. If no track is being recorded, the back key behaves as normally for Android applications: it exits immediately. You can hold the back key or double-tap it to bypass the dialog. While using the back key is the preferred way to quit MyTrails (and most other Android applications), some new users may be disoriented by the lack of an explicit Quit menu, so MyTrails offers such a menu by default. This can be removed in the Behavior preferences. The Track Manager allows you to load GPX tracks, whether saved by MyTrails or any other GPS logger that can export GPX files. Use the Load button or Load all GPX in a directory menu to import one, several or a whole directory of GPX tracks. This operation takes a few moments, but it is performed in the background. As they are loaded, the tracks appear in the list. For each track, you can select whether it should be shown on the map or not, whether it should be colorized according to the current colorization scheme or drawn as a solid line, and the color of the track (used as an outline if the track is colorized). Tap a track to get more information about it. From this screen you can also start or stop recording your current track. Use the Download button to retrieve tracks in your neighborhood from several online communities or your own cloud storage service. Each community or cloud storage service has a slightly different user interface and set of filters. The filters will help narrow the type of track you're looking for, depending on the activity. For track sharing communities, you should first select the location around which MyTrails will look for tracks. Initially, MyTrails will use a small search radius around that location, which you can extend by tapping the Widen search button. Select tracks and tap Download to start the download, which will happen in the background. If you have logged in to the community, your private tracks will be found as well. If not, only public tracks are found. Long tap a track in the main track list, then select Upload track to send the track to one of the track sharing communities or your own cloud storage. Each track sharing community supports different meta-data; please take care when setting this data so that other users can more easily find it. You can choose to send a tweet after upload if elected to make it public when uploading it. Load one ore more GPX: brings up a file selection screen where you can pick GPX tracks to load. You can select more than one. Load all GPX in a directory: brings up a directory selection screen so you can import all GPX within that directory. Show tracks in current map: all the tracks that are close to the current map view are marked as Show. If you only want to show those tracks, use Hide all tracks first. Hide all tracks: mark all tracks as Hidden. Zoom to all tracks: goes back to the map view and centers the map so that all tracks currently marked as Show are visible on the map. Forget all tracks: unloads all currently loaded tracks. 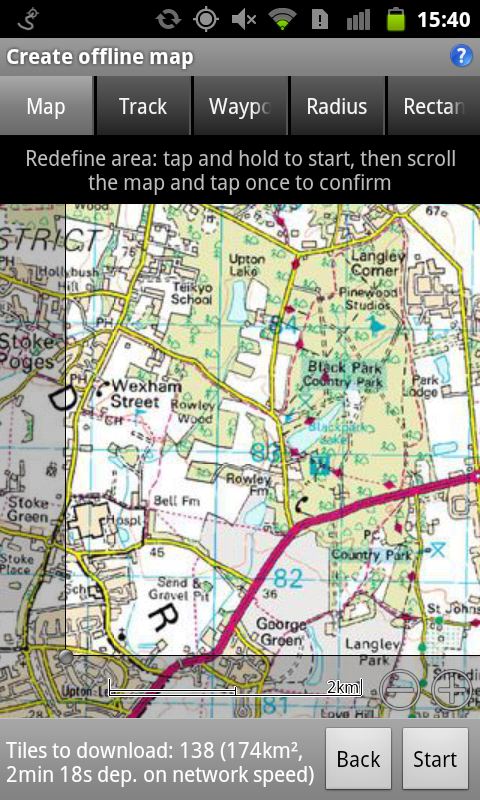 The source GPX tracks are preserved. Track details: more information about the track. Edit track: edit the track name and description. You can check Update the GPX file to re-save the GPX afterwards: this data is stored in the GPX file. Upload track: send the track to one of the track sharing communities or your own cloud storage. 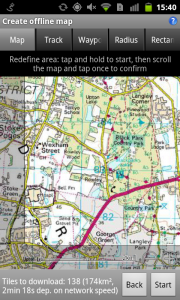 Save track: save the GPX again, possibly into a different location. Share: use to send the GPX via email or another application installed on your device. 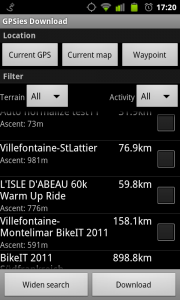 Forget track: removes the track from MyTrails, but does not delete the GPX for your device (for safety reasons). Normalize altitudes (online): uses an online database of altitudes to snap the track to the known terrain altitude. This is generally more accurate than the GPS-calculated altitude, but is not useful when the track wasn't recorded on the ground. After uploading the track to some track sharing communities, you can choose to create a tweet about it. This invokes a twitter client on your device, and in most cases Android will ask you to pick one (or a web browser). Some Twitter clients correctly handle this (the official Twitter client and Twicca) and using a web browser always works (you will be asked to log in if you aren't already), but several popular Twitter clients do not correctly recognize the Twitter API for this. Please see the separate section. 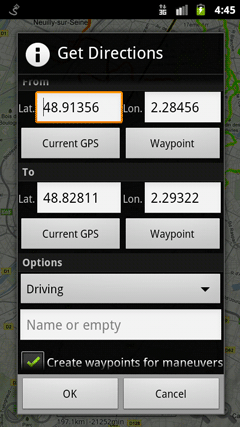 By touching and holding the map, you can add a waypoint, either where you pressed, or at the current GPS location. 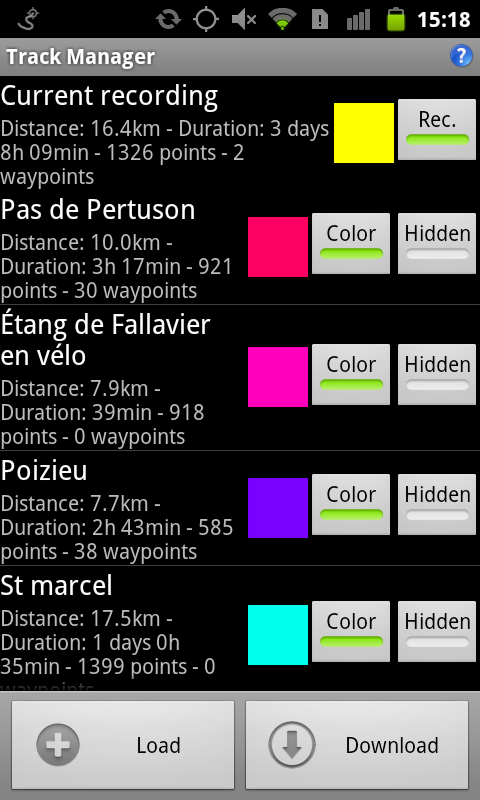 Waypoint names and descriptions can be edited; they can be associated with a saved track (GPX), the current recording, or be global (always shown); and they can either use the same color as the track, or override the track color. Tapping existing waypoints allows you to use the waypoint (tap the tip of the waypoint rather than the body). If several waypoints are in the close vicinity of your tap, a list of nearby waypoints will be displayed first, so you can select the one you intended to interact with. Reposition: this allows you to move the waypoint; other waypoints are grayed out, and you can scroll the map until the waypoint is in the desired location, then tap to confirm, or use the back key to cancel. They way this works may be counter-intuitive the first time you use it, but once you get used to it, it's much easier than the traditional pick-up-and-drag: your finger doesn't obscure the waypoint or the map, and you don't need to worry about what's going to happen if you need to move the waypoint to a point that's further than the edge of the screen. MyTrails is not a Voice Navigation application: it simply offers a basic way to see the path you may want to take to travel from one location to another. It does not have the vector map data that would allow it to correct errors in the GPS location (snapping), it does not offer re-routing, it does not dynamically display navigation instructions, and it doesn't really try to be very smart about directions. When you're getting close to a waypoint, MyTrails will warn you with a selectable combination of vibration, ring and spoken information. This is not restricted to waypoints associated with directions, but works for all waypoints, so you can plan a few turns ahead on a trail that only you know about, and you will get the warning. The distance at which the notification is triggered adapts to your current speed: for highway speeds, it's about 1km (or mile); for slower roads, 500m; for city driving or biking speeds, 200m; for walking speed, 50m. Getting back to the previous warning: MyTrails doesn't try to be smart with notifications, and it doesn't care about the sequence of manoevers in a direction track, so despite our best efforts, the wrong notification could be given; make sure you always double-check, and don't drive into a ditch or jump off a cliff. Reorder to map...: to move the map within the list, select a map in the list that is presented; the original map will be moved in the list to be just before the map you selected. MGM Packs uses the MGM format popularized by Mobile GMaps. Packs can be stored on the device's SD card by synchronizing with your computer. The format allows efficient storage of huge number of tiles, at multiple zoom levels. Tools exist to generate these files. Please see the MGM Howto for more info. Once you have synchronized an MGM pack to your device, you can set the path to it in the MGM configuration either by typing it in, or by clicking Select... (if you synchronized the pack by connecting your device to your computer via USB and mounting the external storage as a USB drive on the computer, the MGM packs will be somewhere under /sdcard). If multiple packs are located within the same directory, you will then have to pick the specific pack the map should use. MGM Packs can be configured with a fallback. Tiles that are not found in the pack will be loaded from the fallback amp. The fallback will usually be an online map (covering the entire world), but it can be a local map as well. If the fallback itself has a fallback, that will not be used (tiles missing from the fallback also will be drawn as missing). The MGM format is used by MyTrails when it downloads a map offline. Please see the relevant section for more info. The flexible URL map editor allows you to use maps that MyTrails hasn't yet discovered, or update the map definition to use different defaults or fix the URL that MyTrails uses in case the map provider has changed their URL format. It is used mostly for OpenStreetMap-based maps, and for other map providers that use a similar URL pattern. You can tap on one of the sample providers to populate the URL and Referer [sic], and you can then tweak the URL to use different options and styles if such are offered by the map provider. Some map providers such as WanderReitKarte offer premium tile services and require a URL that includes a user-specific key. You can insert it in the URL. Web Map Service is a standard protocol used to discover, configure and access web map providers. You can enter the base URL to a WMS map provider. 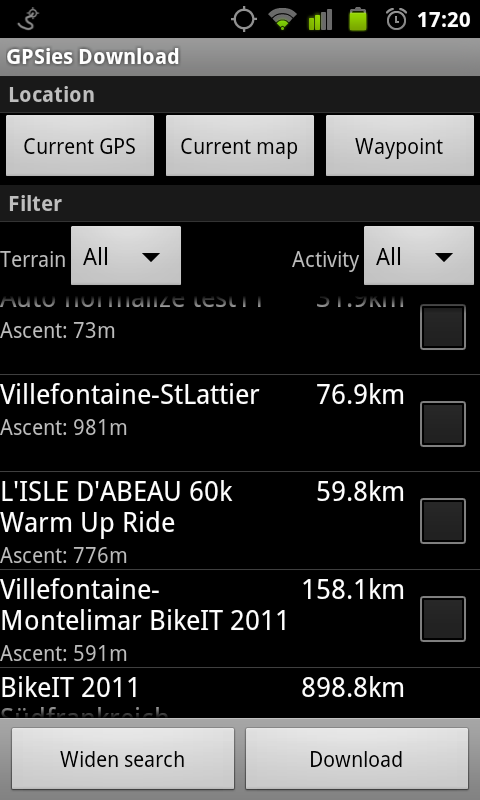 MyTrails will then allow you to pick the parameters for the map, or you can type them in yourself. For example, just before an outing, you can use a WiFi connection to download a map of the area you are going to, so you don't have to use your data connection during the outing. You should avoid mixing premium and non-premium maps within the same offline map, because the security used for the premium parts will spread to the non-premium. Select the zoom levels you wish to download, taking care that detailed zoom levels exponentially increase the download size (each zoom level contains 4 times more tiles, and usually 4 times more data, than the preceding zoom level). Zoom 15 corresponds to a 1:25,000 paper map. If a previous download was interrupted (explicitly, because your device restarted or because of a low-memory condition), MyTrails will offer to restart it when you enter this functionality. Tap Next to then select the download area (on tablet devices, both screens are displayed simultaneously). Map: long-tap on a corner of the area you wish to download, which will position a pin; by then panning the map, you will be able to select the opposite pin that defines the rectangle to download. You can use the zoom buttons, and tapping one of the pins allows you to easily refine the area definition. The first time you use this method, you may feel it's working backward, but as you get used to it, you will be able to quickly and precisely set the download area. The trick to getting the hang of it is to think of the download area as a rubber band stretched between the 4 pins. When you tap a pin, it is lifted off the map and you can move the map below the hovering pin (so you move the map, not the pin). You can move the rectangle by tapping the pin in its center. To select a previously-downloaded area, you can tap the pin with a rewind arrow in the bottom right of a blue or green rectangle. Green areas represent previous downloads to the same offline map; blue areas (only in premium maps) represen areas downloaded from the same source map (irrespective of the destination, even if the download was performed on another device). 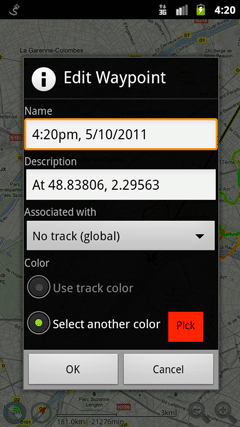 Track allows you to pick a track; MyTrails will then select the area around the track. Waypoint allows you to select a waypoint (global waypoints or waypoints of any track in the Map Manager) and you can then select a radius around that waypoint. Radius or Rectangle: enter the coordinates of the center and the pseudo-radius or two corners of the area you want to define. In all cases, you can jump to another tab to update the area you defined. The number of tiles to download is displayed in the status area. Depending on your connection, each tile takes around a second to download, so make sure you don't select too many. For premium maps, you need to remain within the maximum area corresponding to your subscription, or purchase additional subscriptions (tap Back to go back to the previous step to check). Once the settings are ready, you can start the download. The download process happens in the background, so you can go back to the map or close MyTrails entirely. A notification will allow you to easily come back to the offline map view, so you can pause or cancel the download. You can start using the map offline immediately, although only tiles already downloaded will be displayed. By default, the download is automatically paused if a WiFi connection is not available. You can change that behavior in the preferences. Tiles downloaded for offline maps are stored in MGM packs. You can select in the preferences where these MGM packs are stored. Larger icons: increases the size of on-map icons (current location, waypoints and tracks), and the scale display, for better visibility outdoors or on moving "vehicles". Larger buttons: increases the size of buttons and spreads them apart more to make them easier to hit. Larger map: allows you to change the density of how the map is drawn. Recent screens use a very high pixel density which may make it hard to see map details when MyTrails draws map tiles at 1 map pixel for one screen pixel resolution. You can let MyTrails automatically adapt to the resolution or force it to draw the map bigger to compensate (it will be less sharp). Draw accuracy circle: if enabled, the current GPS location will be denoted by a blue circle, the radius of which indicates the accuracy radius of the current GPS reading. The smaller, the more accurate. If disabled, a red GPS dot will be displayed instead. Allow overzoom: allows MyTrails to zoom in beyond the maximum available zoom level for the map you're currently viewing. This makes the map slightly blurry, but it can help readability when bright sunlight is making the map hard to read. Full screen mode: if enabled, the notification bar (with signal, battery strength, etc.) will be hidden to leave more room to the map. On Android 3 and later, a button will be displayed at the top-right when full-screen is active to bring up the Action Bar. Always show legend: display the legend above the map (Pro only). You can also use the Tracks > Colorization legend menu to display the legend on-demand. Display zoom level: draws the current zoom level next to the zoom buttons. Display coordinates: allows you to select a coordinate system (global like DMS [degree-minute-second] or local like GB National Grid) to optionally display the coordinates for the center of the screen (a reticle will be drawn at the center). Solid: just the track shape, a bright yellow line. Altitude: the track is colorized according to the altitude (green for low points on your track, orange and red for intermediate and black for the high points). Rate of ascent: increasingly bright red for faster ascents, blue for descent. Speed: grey for stationary or very low speed, green for moderate speed, brightening to reds for higher-speed parts of your track. GPS accuracy: red for low accuracy, orange for intermediate, green for high accuracy. Slope: increasingly bright red for steeper ascents, blue for descent. The difference between rate of ascent and slope is that rate of ascent reflects how quickly you went up or down, whereas the slope merely reflects how steep the trail was. Track color: the color used for the current track recording. If the colorization is not set to Solid, this color is used as an outline. Thick track highlight: check if you prefer the track to be more visible. Use Metric units: uncheck to use Imperial units instead of the default Metric units. Display zoom level: check to indicate the zoom level next to the map scale. Display track duration: uncheck if you don't need the track duration next to the map scale. Larger scale display: check to have the scale displayed larger, so it's more readable in harsh sunlight. Long compass filter: enable this to prevent wobble in the compass, which can make the map hard to read on some devices. The side-effect will be that the compass will have more inertia, so it will not respond as quickly when you reorient the device. Filter GPS readings: this will filter out anomalous GPS readings, for example if the connection to the GPS is lost and cell location is employed instead. This may cause a longer delay when acquiring the signal initially and may drop readings, for example if you try recording a track while moving very quickly (on a plane, for example). Sticky GPS: if this option is checked, the map will automatically center on the GPS after you've dragged it around, if the follow GPS icon was highlighted before you started dragging the map. Disk cache: determine how much of your external storage can be used to cache downloaded map tiles. In any event, MyTrails will always leave 1MB free. Wifi-only offline map creation: uncheck this if you don't mind your phone continuing to download offline maps using your data connection rather than WiFi. Proximity notification: select the type of notification used when you're approaching a waypoint (Pro only). Hide Quit menu: this will remove the Quit menu, which is enabled by default for new users. Any application that uses the GPS continuously will run the battery down at an accelerated rate. MyTrails takes many precautions to minimize battery usage: the compass is put to sleep when you turn the screen off, and GPS readings are taken as rarely as possible, while still recording an accurate track. The screen is redrawn only when necessary. You can turn the screen off to conserve the battery: MyTrails will keep recording. You can even close the application (leaving the tracker running). You will notice that while MyTrails is recording your track it adds a notification to the Android notification bar. You can tap on it to get back to MyTrails. If you're taking a break, you can stop the tracker to minimize battery drain. Just don't forget to start it again once you get going. You can also use the Optimize battery preference to turn off the most battery-draining features of MyTrails. You should also turn mobile data off if you intend to use MyTrails for more than 6h on a standard phone: even when not in use and especially in remote areas, cellular data uses a lot of power. Don't worry about data loss if your battery runs out while you're recording a track: MyTrails saves the track frequently and will load it in when you turn the device back on. For multi-day trips without the ability to recharge your phone, you should consider spare batteries (if your phone doesn't use a sealed battery) or an external battery pack, which will allow you to recharge through the MicroUSB port. There are many different models of external battery packs, of varying capacities. The safest policy when travelling abroad is to turn off mobile data entirely on your device, in Android's settings. This will avoid any source of bill-shock from applications using data in the foreground or the background. Some of MyTrails' features will no longer work (you will not be able to view maps that are not cached or downloaded to offline maps, you will not be able to normalize tracks and post or download them to track-sharing communities, get directions, etc. ), but MyTrails deals with this gracefully (including the ability to defer track activities). If you do keep your mobile data on, please be aware that even if you're using MyTrails with an offline map, a small amount of data usage may occur: checking for updates, license verification, helping the GPS get a faster fix, the occasional geocoding request, as well as the more obvious cases above. Also be mindful that if you have configured your offline map to have a fallback, tiles that are missing from the offline map will be downloaded over your mobile connection. This entry was posted on 23 January 2012 by frogsparks.